Within the Apocrypha, you will find many similar elements to the Book of Mormon. You will come across Nephi, Ammon, Ammonites, Laban, and many other familiar characters. You will also find the brass plates, the treasury where the plates are kept, and abridgments being made. You will probably also notice the faith-promoting nature of many of the stories that will have a ring of truth to them, even though they are widely known to be fictitious. Laban resides in Jerusalem and has possession of the brass plates. Holofernes is sent by King Nebuchadnezzar to conquer the rebellious Jews. The city of Bethulia is under siege by the Assyrians. Nephi tells his father that he will return to Jerusalem to obtain the Brass plates of Laban and God will deliver them. Judith, a Jewish resident of the city of Bethulia, tells the people that she will return to their oppressors and God will deliver them. Nephi enters the walls of Jerusalem under cover of darkness. Judith enters the city walls at night. Nephi finds Laban drunk and lying in the street. Nephi resists the idea of killing Laban even after he is told to do so. Judith impresses Holofernes with her charms and gets him drunk. He passes out on his bed. Nephi holds up Laban’s head by the hair and cuts if off with his own sword. Judith holds up Holofernes’ head by the hair and cuts it off with his own sword. Nephi leaves Laban lying in the street, but takes and puts on his armor and sword. Judith takes Holofernes’ head with her back to the city to prove what she has done. Nephi obtains the records from Laban’s house and leaves the city. The Jews, upon learning of the death of Holofernes, leave the city and plunder the Assyrians camp. The apologist response for these parallels is that the apocrypha was not available to Joseph Smith. However, it is known that bibles were very common in early 19th century America, and many contained the Apocrypha. A Google Books search will reveal many early bibles containing the apocrypha from that era (see, for example this link and the image below). Also, the story of Judith beheading Holofernes was famous among Bible readers of Joseph Smith’s day, and was also the subject of many fine works of art (for example, see this link). Furthermore, the Apocrypha is a short collection of short pamphlets written after the death of Christ. The “Book” of Judith, for example is only 12 pages long. Thus, in an hour of reading, a person would have access to the plot elements of the story. Joseph Smith appears to have included many plot elements, names, and teachings from the Apocrypha in the Book of Mormon. 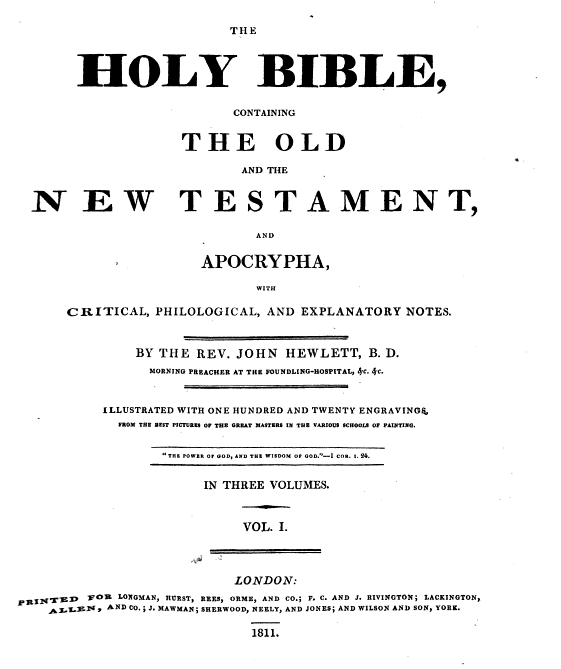 Furthermore, the Apocrypha was a subject of controversy around 1825-1826, just a few years before Joseph Smith began working on the Book of Mormon, at which time the British Bible Society stopped including the Apocrypha in their printings of the Bible. This likely caught Joseph’s attention as it was the subject of news and controversy among Protestants during that time. A more thorough treatment of the Apocryphal source materials found in the Book of Mormon can be found here. Continue to Book of Mormon Origins. This entry was posted in Book of Mormon, Joseph Smith and tagged Ammon, Apocrypha, Book of Mormon, Laban, Nephi, remix. Bookmark the permalink.